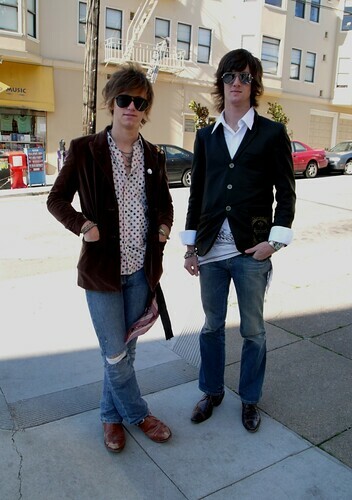 These two were the last people you'd expect to see walking around Noe Valley on a weekday morning. It'd be like bumping into an Aerosmith cover band in Ravenna. Nice guys too. i'm really into the blazer on the guy on the right guy. their sunglasses are very covetable. I love cute rockers, but these guys are... well, kind of icky. I get the "I'm trying waaaay too hard" vibe off them. Which could be why they were in Noe Valley. Hi anon. - Ouch. I can see where you're coming from; these guys are definitely more Aerosmith than Franz Ferdinand, but I respect that in a way. & the fact that they're rockers w/o wearing skinny jeans is impressive in this day & age. Plus they were surprisingly un-try-hard & pleasant to speak to. Rock on. You're right, that was kind of harsh (easier to do when you're "anonymous") and it's cool that they were easy to chat with and I will concede that the dude on my right has some really wonderful oxfords on.